Village Theatre premiered “Singin’ in the Rain” last night (November 10), the stage version of a 1952 Gene Kelley/Donald O’Connor movie musical. The production is sumptious; the acting and dancing is wonderful; the singing of standards like “You Stepped Out of a Dream,” “Good Morning,” “You Are My Lucky Star,” “All I DO is Dream of You,” not to mention the title ditty, “Singin’ in the Rain,” ranged from competent to delightful with nary a sour note in the bunch. The staging of the show’s signature show-stopper — where male lead John David Scott sang and danced in a drenching downpour that might easily have drowned downtown Issaquah had the stage not been craftily drained — lived up to every expectation I or anyone may have had going into the evening. Still, I feel compelled to issue the following warning to anyone suffering from diabetes: take extra insulin with you if the plan to see “Singin’ in the Rain.” The show — not the production, but the underlying script — is one huge helping of vacuuous, if sumptuous, cotton candy. My blood sugar checked in at over 200 this morning (100 is normal): extremely high for a diabetic like myself who tends to run on the low side. I enjoyed every moment of Village’s production and highly recommend you see it if you’re looking for two hours of fun, energetic singing’ and dancin’. But do go with the understanding that, while your senses and funny bone will be delighted, your brain will not be challenged. In the slightest. None of which is the fault of the actors, crew, or staff of Village. They do their best with what they’ve got, and all things said and done, that’s pretty darn good. Oh, I suppose Village could be faulted for choosing to mount “Singin’” in the first place … but heck, with the list of delightful tunes that accompany the spun sugar, how could they resist? Not to mention the big production numbers: while the show boasts a relatively small cast (30 members by my count, including Ensemble members), in the, shall we say, compact space that is the Gaudette Theatre stage, that group resounded like what would be a cast of hundreds in a Broadway venue. And they have their work cut out for them: the short second act is, essentially, one long production number that bears little resemblance or connection to Act I. Once again, let me emphasize that this entire production is a joy. Wonderfully entertaining. Well worth spending an evening on, almost the perfect recipe for clearing your mind after the events we’ve endured over the past months. (Indeed, I can’t help but wonder if the timing of the opening, two days after election day, might have factored into Village’s choice of “Singin’ in the Rain”: there is nothing quite like two hours of mindless entertainment to take you away from two years of armed political combat.) Oh, there are nits that could be picked: a weak (though not bad) voice here, a questionable costume decision there … but none of them add up to a hill of beans. 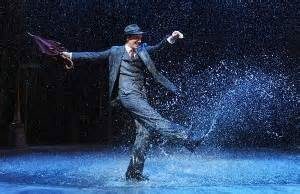 “Singin’ in the Rain” will send you forth into the night humming tunes and itchingh to dance for yourself (and it’s likely enough, given the time of year, that you’ll be doing those in the rain outside the theater as much as our hero did it on stage). Take it for what it is — an evening of mindless entertainment — and just enjoy. Singin’ in the Rain: at the Francis J. Gaudette Theatre in Issaquah November 10 through December 31; moving to the Everett Performing Arts Center January 6 thru 29.